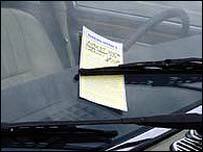 Traffic wardens in Northern Ireland are to be privatised from 2006, NIO minister John Spellar has said. Current wardens, deployed by the Police Service, will be withdrawn from enforcing on-street parking regulations to focus on areas such as road safety. Mr Spellar said the Department of Regional Development (DRD) will take over responsibility for parking fines. It will change the law to include the use of clamps, and offences will be civil not criminal. This has led to fears that clamping will increase. Mr Spellar said: "The decision to employ a specialist contractor is based on extensive research on the best practice of enforcement across the UK." The PSNI said it was to withdraw staff from enforcing on-street parking restrictions to focus on other areas such as road safety. The Roads Service is also to lose about 30 staff who look after car parks and these positions will also be filled by people from a private company. Albert Mills from the Amalgamated Transport and General Workers Union said it would have implications for civil servants and motorists. SDLP assembly member Alasdair McDonnell said the decision to privatise traffic wardens was "bad news" for motorists as parking tickets and clamping would now be "motivated by profit rather than public safety".